Beloved comedian, philanthropist, designer and global businesswoman Joan Rivers was known for her exquisite taste in fashion and interior decor. As the recent, highly successful Christie’s estate auction of her fine and decorative art collection revealed, Rivers appreciated quality and consistently bought the best of every category. While many pieces in the Manhattan auction sold for prices beyond the reach of the average buyer, another opportunity awaits on July 20-21 to acquire beautiful furniture, decorative art, jewelry, silver and artworks from the Rivers estate, but at more accessible price points. Litchfield County Auctions will host the approximately 600-lot, no-reserve sale at their gallery, with absentee, phone and Internet live bidding available for those who cannot attend in person. All items are from Rivers’ Connecticut country estate or New York apartment. The Wednesday session will be devoted to fine and decorative art, while Thursday’s lineup features Rivers’ wonderful collection of jewelry and accessories. A portion of the auction proceeds will benefit Guide Dogs for the Blind, and God's Love We Deliver. Until 2013, Rivers owned a rambling 76-acre estate on New Preston Hill Road in New Milford, near the gallery where the auction will take place. She was active in the community and frequently attended events and social affairs around Litchfield County, whose towns are regarded as the Hamptons of Connecticut. Every item chosen for her breathtaking residences had to have Joan’s stamp of approval before entering the front door, so even though there may be bargains available on July 20 and 21, Rivers’ discerning eye and uncompromising attention to detail will be evident in each auction lot. The artworks in Rivers’ Connecticut residence crossed many genres, from canine depictions to French landscapes. For her country home she favored British mahogany furniture and traditional accessories. But unsurprisingly, Joan also had a bold and witty side to her decorating choices, as seen in the low bench upholstered in cerise and ivory, with lime-green bolsters. One of the more-recognizable auction items from Rivers’ elegant Fifth Avenue apartment in New York is an antique cast-lead garden sculpture of the Angel Gabriel with his horn. The life-size figure on a marble plinth oversaw Central Park from its lofty perch on the apartment’s terrace and appears in many magazine photos of the Rivers residence. Dinner at Joan’s house was always a stylish affair, with porcelain dinnerware, sparkling crystal and fine silver. Many dinner services will be auctioned, as well as luxe accessories, such as a pair of .800 silver table trees by Ludwig Neresheimer. 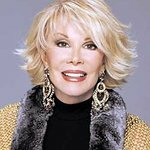 Arguably, no American designer did more to bring sophistication and superior workmanship to costume jewelry than Joan Rivers. Her now-classic creations allowed every woman the opportunity to accessorize effortlessly, knowing each piece was stylish and beautifully made. The July 20-21 auction will open Joan’s personal jewelry box, containing chains, necklaces, beads, brooches, and the sensational enameled and jeweled bangles that were a staple of her collection. The jewelry items will be grouped in lots and offered with attractive estimates. Litchfield County Auctions’ Wed./Thurs. July 20-21, 2016 auction will start at 10 a.m. Eastern Time on both days. The gallery is located at 425 Bantam Rd., Litchfield, CT 06759. Preview from 10 a.m. to 5 p.m., Friday, July 15 through Tuesday, July 19, inclusive. For additional information on any item in the auction, call 860-567-4661 or email sales@litchfieldcountyauctions.com. Web: www.litchfieldcountyauctions.com. All forms of bidding will be available, including absentee or live via the Internet through www.LiveAuctioneers.com.